Charles Lyman Eustis must have been one of those legendary Maine characters, fiercely independent and self sufficient, living off the land, working hard, fishing and hunting for his dinner and working from dawn to dusk. At the young age of 20 he had enough of a pioneering spirit to move up from Lewiston to the mountains of Western Maine and actually buy the land that was eventually named after him as well as the land next door that became the village of Stratton. He saw the river that ran out of a large lake with its swift current and its waterfall. He saw forests full of trees that could be logged profitably and that supported wildlife for hunting. He saw the old paddling and portage trail that ran through the area where Indians and explorers, trappers and traders had traveled on their way between the ocean and Canada. The lake and the river were full of fish. This was a land of opportunity! So he settled down and built a sawmill and a gristmill, providing jobs and building material and food for the nearby settlers. The frontier spirit of Charles L. Eustis once “defined the region’s character” relates Sarah Schweitzer in the Boston Globe 2/27/05, a spirit that has faded as residents moved to more civilized and profitable ways of making a living. But Charles was in the thick of it, relishing his freedom and enjoying the beautiful mountains of Western Maine. Looking at the portrait, you can see this pioneer. His pleasant face with its smooth brow looks peaceful and proud. The ruddy cheeks indicate his rustic outdoor life and hard work. Notice the contrast between his tousled hair and his starched white shirt collar, a woodsman uncomfortable in a suitcoat, but probably a practical one. Note the thick fabric with a warm collar that could be raised and secured with a large button on the back side of the left lapel matching the large buttonhole on the right. The tie is clumsily worked in a flat bow, but his fancy shirt is smooth with no buttons showing and a fashionable high collar. Under him at the base are evergreen branches with pinecones symbolizing the pine woods in which he worked and the official tree of his home state of Maine. The lettering is clear and unpretentious and the frame of the portrait is simple and dignified. It arches above his head, scrolled at the ends around smooth round nail heads, underlaid with an egg and dart design fillet. The side borders are thin at the top, widening at the bottom like the bottom of tree trunks set on pedestals, forming the two ends of a flat panel displaying his dates. Pine branches curve up around the ends overlapping both the bottom panel below and his coat above. The base of the frame is slightly thicker than the curving top. Frederick Allen was thoughtful in his portrayal of his subjects and careful about the details and symbols. He understood Charles Eustis. He, himself was very self-sufficient and unpretentious, spent all his summers in Maine on an island, loved the woods and eventually retired to his property in New Hampshire with its rushing trout stream, waterfall and the view of a mountain. He built a little cabin where he and Agnes spent many happy times then moved uphill on his 100 acres where he had a home built to live out his days. 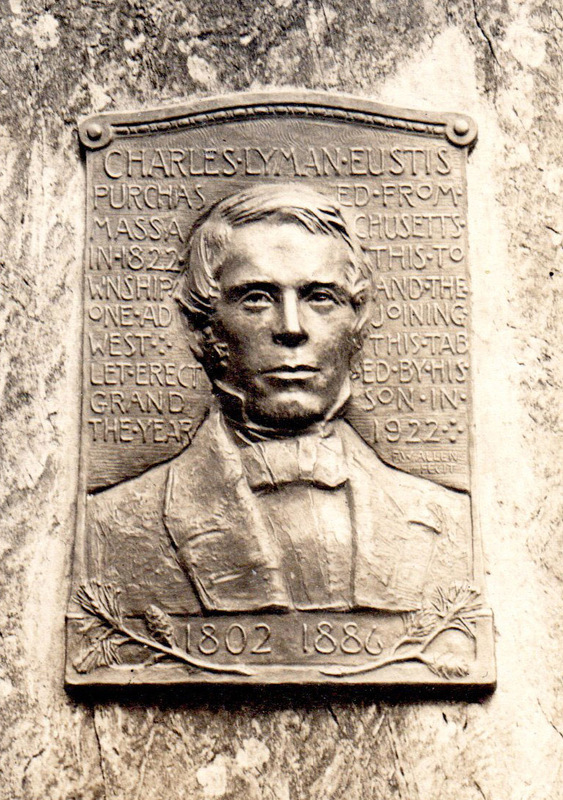 The grandson of Charles L. Eustis appreciated what his Grandpa had done and, in wanting to celebrate that, erected this memorial to him in 1922, the centennial of the purchase of the land that became the town of Eustis. It has always been at The Cathedral Pines Campground mounted on a huge natural boulder on the shores of Flagstaff Lake with its magnificent views and peaceful natural surroundings. Here was a place where his grandfather would have wanted to rest at age 84 after his lifelong labors and be at peace in the beauty of the Maine woods he loved. THIS TOWNSHIP AND THE ONE ADJOINING WEST. THIS TABLET ERECTED BY HIS GRANDSON IN THE YEAR 1922.